In Making the Arab World, Professor Fawaz Gerges, a Christian Lebanese author, examines the clash between Arab nationalists and Arab Islamists. In the 1950s, the Muslim Arabs vacillated between pan-Arabism and pan-Islamism. Egypt’s Gamal Abdel Nasser (1918–70) led the movement for pan-Arabism whereas Egypt’s Sayyid Qutb (1906–1966) strove for pan-Islamism. Over the decades, the contest between nationalists and Islamists has been murderous, not merely ideological. The book’s title Making the Arab World is somewhat misleading, perhaps selected for marketing purposes as to appeal to a broader audience. Its “broader historical-thematic structure” focuses on the personal-ideological clash between Nasser and Qutb, both Egyptians, a clash that has arguably shaped the Arab world and pan-Islamism. This theme is an ambitious academic leap that forces Gerges to make a colossal amount of historical reductionism, seeing the entire Arab world through the Egyptian keyhole. 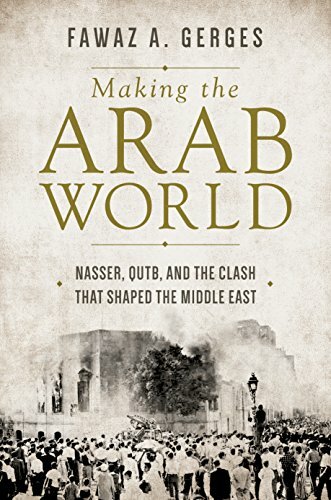 As a result, the book’s subtitle, Nasser, Qutb, and the Clash that Shaped the Middle East, is also confusing. The Middle East, by all definitions, includes Turkey and Iran, and there is no showing in the book that Nasser and Qutb shaped any ideological parameters in Turkey and Iran. Apparently, Gerges associates the Middle East with Arabs only. Pan-Arabism, now spanning over 22 nation-states, offers an elusive ethnic unity beyond national, religious, racial, political, and territorial boundaries. The Arabic language, though amply variant in regional and local dialects, is the adhesive that presumably binds the Arabs from Morocco to the United Arab Emirates. Given the presence of Christians and Jews, secularism rather than Islam offers a stable foundation for pan-Arabism. For the most part, however, the dreamed Arab unity is wishful thinking, stoked by surreal poets, unreal sociologists, connoisseurs of French secularism, and defunct demagogues such as Nasser. Pan-Islamism, now spanning over 57 nation-states, also offers an elusive unity (ummah) beyond national, racial, political, territorial, and linguistic borders. The religion of Islam, though splintered into sects and subsects, is the core factor that could unite Arabs and non-Arabs into a single ummah. Muslim Brotherhood (Ikhwan), Al-Qaeda, ISIS, and theoreticians such as Qutb champion a single ummah under the leadership of Arabs. Pan-Islamism, too, is a fairy tale. Gerges’ book erroneously equates pan-Islamism with the Ikhwan ideology. The equational error is obvious. For example, the Islamism of Saudi Arabia is as much opposed to the Ikhwan Islamism as to the Nasserite secularism. Abdul Wahab, rather than Qutb, determines Saudi Islamism. Likewise, Shia Arabs in Iraq, Syria, Lebanon have little use for Qutb’s (Sunni) pan-Islamism. Most importantly, the Ikhwan exercise minimal influence on the pan-Islamism of non-Arab Muslims, who constitute more than two-thirds of the Muslim ummah. The Ikhwan Islamism does recruit followers in some Arab countries but the Ikhwan pan-Islamism is as surreal as that of Al-Qaeda or ISIS. The seething conflicts in the Middle East involving Saudi Arabia, Iran, Syria, and Yemen have little to do with Arabism and Islamism. The 1950s romance with a single Arab nation or a single Muslim ummah has been undermined with lethal wars and civil mutinies. For now, pan-Arabism and the associated secularism are dead, though some Arab groups are still fighting for pan-Islamism aspiring to install Arab hegemony over all Muslims. In identifying the personal and ideological conflicts between Nasser and Qutb, Gerges provides historically valuable information, obtained through interviews with contemporaries close to Nasser and Qutb. These two great Egyptians rose from ordinary families to influence the politics of their country. Initially, Nasser and Qutb had converging aspirations to oust the British and restore the “dignity” of Egypt as an independent nation. The mid-20th century witnessed decolonization movements in all parts of the world. Great Asian and African leaders, including Gandhi, Jinnah, Sukarno, and Kaunda, rose to the global scene to fight for the independence of their nations. Thus, the Egyptian movement for independence cannot be separated from the rest of the global movements for national liberation. However, Gerges does not see the need to contextualize Egypt in the global phenomenon of anti-colonialism, leaving the unintended impression that Nasser was a sui generis leader of decolonization in the Arab world. After ousting the British and King Farouk, Gerges correctly indicates, Egypt experienced political turmoil, inviting competing ideologies of secularism and Islamism. Under the influence of the Soviet Union, Nasser (like Nehru and other leaders of the newly independent states) turned to secularism and socialism. However, a counter-ideology derived from Islam, and led by the Ikhwan, offered an alternative to the Egyptians. Qutb joined the Ikhwan while Nasser shifted more toward secular militarism. Gerges furnishes an excellent account of how Nasser and Qutb drifted away from each other to the extent that Nasser began to consider Qutb as a threat to the post-colonial military rule in Egypt. In 1966, Qutb was executed not because he was an Islamist opposed to secularism but because he “conspired” to assassinate Nasser. Thus, the conflict between Arabism and Islamism, if there were any in the first place, died in the womb of Egyptian interpersonal rivalries. The gradual entrenchment of the corporatist military in Egypt, a point that Gerges makes with brilliant sophistication, weakened the potential allure of secularism, particularly for Muslim Egyptians. Anwar Sadat, who succeeded Nasser, mended relations with the Ikhwan. Regionally, Nasser’s secular Arabism would die as the Arab rulers, such as Ghaddafi, Hafiz Assad, Saddam—promoting personal cults and family hegemony—became more and more nationalistic with hodgepodge philosophies. In Egypt, however, the struggle between the military and the Ikhwan continued while the military ruled Egypt for decades. The Ikhwan, highly effective in providing social services, would eventually turn to democracy as a counterforce to the corporatist military rule. The Egyptian military, trapped in international cobwebs, including making peace with Israel, could not afford to be a secular force opposed to Islam. Accordingly, the military emphasized national security over ideological purity. Nonetheless, the military infuriation with the Ikhwan deepened after Mubarak was toppled in the Arab Spring and Muhammad Morsi of the Ikhwan was elected to the high office through the first genuinely democratic election. Within months, Morsi was overthrown and arrested and the military regained control of Egypt. This Ikhwan downfall, however, cannot be interpreted as a triumph of the Nasserite secularism. It was the conquest of the corporatist military. Gerges does a wonderful job in capturing Qutb’s fascinating personality. He traces Qutb’s development from a country boy who has memorized the Quran to a literary critic in Cairo. At one point, Qutb was skeptical of Islam and “went as far as to suggest that Islam and the Arabic language were alien to the Egyptian temperament and character.” He engaged in fortune-telling and enjoyed reading Sherlock Holmes. Gerges’ book will do little to moderate the people of Egypt, broadly divided into two opposing camps. First, there are those who view the Ikhwan as a mortal threat to peaceful Egypt. They see Qutb as a “philosopher of terrorism.” This camp, including some U.S. terrorism experts, is open to the military rule to ward off the Ikhwan. Second, there are those who view the corporatist military as a pestilent threat to democracy and human rights. They find merit in resistance to the military rule even if the resistance comes from the Ikhwan. By no means is Gerges supporting the Egyptian military or its human rights abuses, though he has a soft corner for secular Arabism. For sure, the book will please readers interested in the nitty-gritty dynamics of cooperation and conflict first between Nasser and Qutb and now between the military and the Ikhwan shaping the destiny of Egypt.